Mark Wallinger’s ‘Folk Stones’ at first appears like an almost banal numbering exercise, a “significant yet pointless act” as he puts it, recalling the labour of a modern-day Sisyphus. Yet the precise number of beach pebbles collected and laid out into a massive square reveals a profound underpinning: 19,240 individually numbered stones stand for the exact number of British soldiers killed on 1st July 1916, the first day of the Battle of the Somme. The work is inspired by the millions of soldiers who left from Folkestone Harbour to fight on the battlefields of France and Flanders, and is located adjacent to other older war memorials. 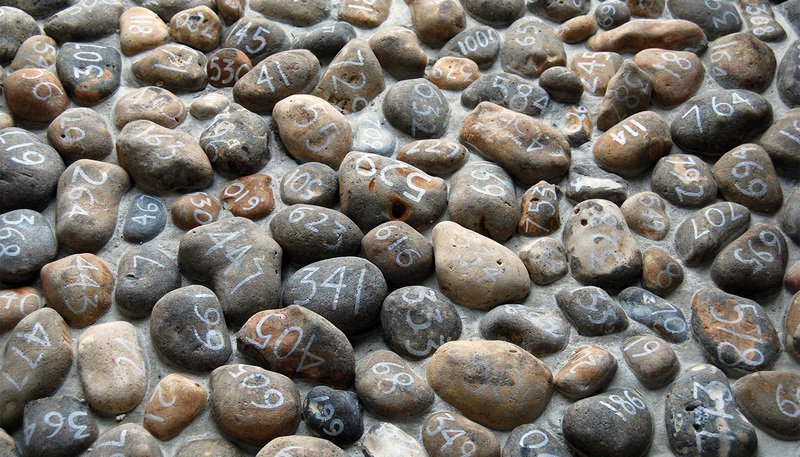 But, by using metonymy to create the idea of a crowd ‘numberless as the pebbles on a beach’, Wallinger has created a very different form of remembrance monument in which numbers replace names. Folkestone was the main point of departure for hundreds of thousands of soldiers leaving for the battlefields of northern France during the First World War. The poet Wilfred Owen spent a night at the Metropole hotel before embarking for France, and later described its lush carpets as being as thick as the mud in the trenches. For countless other soldiers too, Folkestone must have provided some final home comforts, and its beaches and cliffs would have been the very last glimpse of England many would ever see.